06/01/09 P62. 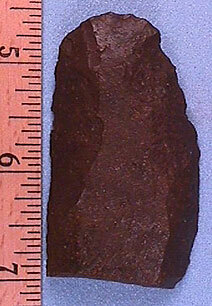 (P57) Uniface blade, 3 1\2", found near Savannah, TN, pretty Buffalo Creek chert, thin and colorful, $16. PRICE REDUCED TO $12. 06/01/09 P62a. (P57a) Other side of the above. 06/01/09 P63. 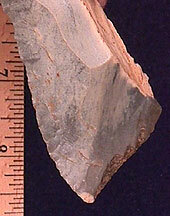 (P58) Flake knife, 3 1\4", TX, high quality Edwards Plateuu, ex-Van Buren collection, very thin and sharp. $29. PRICE REDUCED TO $24. 03/18/08 P64. (P61) Flake knife with chisel tip, 4 7/8" L x 1 5/8" W, southern IN, hornstone, $175. PRICE REDUCED TO $75. 03/18/08 P64a. (P61a) Other side of the above. 03/18/08 P65. (P64) Backed knife\side scraper, 3 15/16" L x 1 3\8" W, KY, mottled gray\tan\red, ex-Von Hillard collection, $39. PRICE REDUCED TO $34. 03/18/08 P66. 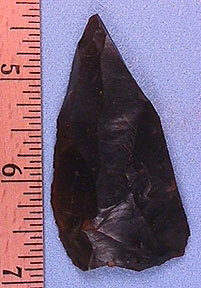 (P65) Flake knife, 3 13/16" L x 1 7/16" W, found by Oscar Allen, KY, Ft. Payne, very thin and sharp, $45. PRICE REDUCED TO $35. 03/18/08 P67. 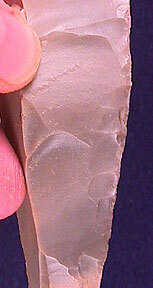 (P66) Uniface knife\scraper, 3 5/8" L x 1 15/16" W, KY, Ft. Payne chert, very thin flake knocked off of a cobble, very thin with fine edge work, $25. PRICE REDUCED TO $19. 03/18/08 P67a. (P66a) Other side of the above. 03/18/08 P67b. 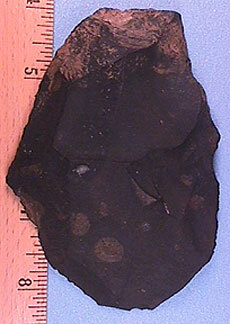 (P66b) Close up of edgework (much nicer than the picture). 03/18/08 P68. 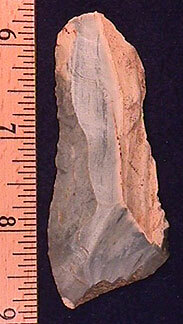 (P67) Uniface blade, 3 1/2" L x 1 9/16" W, CO, fine grained quartzite, ex-Bob Roth collection, $35. PRICE REDUCED TO $29. 03/18/08 P69. (P68) Flake knife, 3 7/16" L x 1 3/8" W, KY, banded glossy gray and tan, killer edgework and ergonomic, $35. PRICE REDUCED TO $29. 03/18/08 P69a. 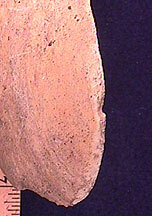 (P68a) Close up of edgework (much nicer than the picture). 03/18/08 P70. (P69) Flake knife, 3 1/8" L x 1 3/8" W, KY, hornstone, fine edgework, $29. PRICE REDUCED TO $24. 03/18/08 P70a. 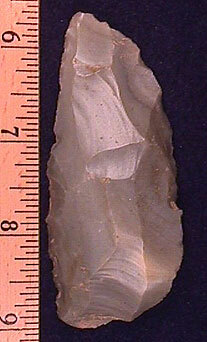 (P69a) Close up of edgework (much nicer than the picture). 03/18/08 P71. 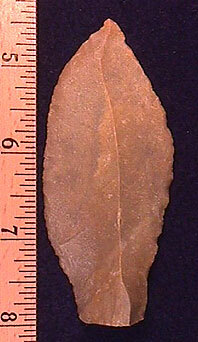 (P70) Flake knife, 2 5/8" L x 1" W, Richland Co., OH, glossy mottled brown, thin and well made, $25. PRICE REDUCED TO $19. 03/18/08 P72. (P71) Unifaced scraper\knife, 3 1/8" L x 1 7/16" W, MT, Knife River (?) patinated white, killer edge work, $29. PRICE REDUCED TO $24. 03/18/08 P72a. 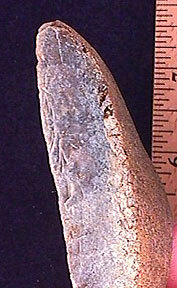 (P71a) Close up of edgework (much nicer than the picture). 03/18/08 P73. 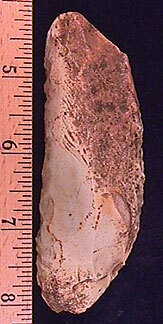 (P72) Unifaced side scraper\knife, 4 3/8" L x 1 3/16" W, Bath Co., KY, green Carter Cave with red stripes, big example, $30. PRICE REDUCED TO $24. 03/18/08 P74. 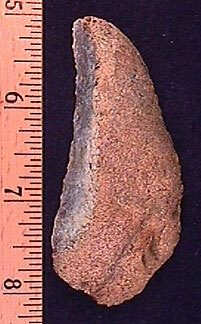 (P73) Flake knife, 2 3/4" L x 1 3/8" W, KY, colorful Boyle chert, fine edge work, $19. PRICE REDUCED TO $14. 03/09/08 P75. (P70) Uniface knife, 3 11/16" L x 1 7/16" W, Ross Co., OH, gray and tan, ex-Shirley Denman, killer edge work and very ergonomic, from my personal collection, $29. PRICE REDUCED TO $25. 03/09/08 P75a. 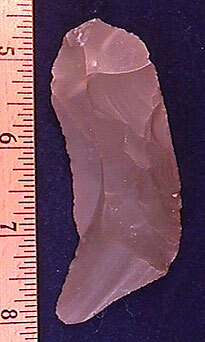 (P70a) View of the edgework. 03/09/08 P76. 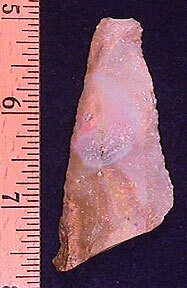 (P71) Flake knife, 3 7/8" L x 1 3/16" W, Bath Co., KY, Carter Cave chert, unusual shape and appears to be for use in the left hand, fine retouch along working edge, $35. PRICE REDUCED TO $29. 03/09/08 P76a. (P71a) Other side of the above. 03/09/08 P77. (P72) Flake knife, 3 3/8" L x 1 1/2" W, KY, hornstone, made on a flake, very ergonomic with both cutting and scraping areas, from my personal collection, $35. PRICE REDUCED TO $29. 03/09/08 P78. 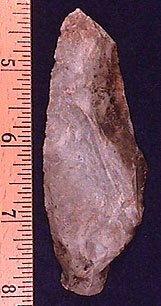 (P73) Flake knife, 3 1/16" L x 1 1/8" W, Coryell Co., TX, Edwards Plateau chert, thin and well made, from my personal collection, $25. PRICE REDUCED TO $20. 03/09/08 P79. 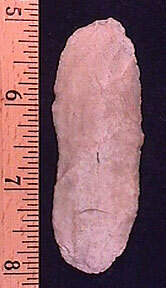 (P74) Scraper\knife, 3 1/2" L x 2 9/16" W, KY, Ft. Payne chert, fine example of a multi-use tool, from my personal collection, $35. PRICE REDUCED TO $29. 03/09/08 P80. 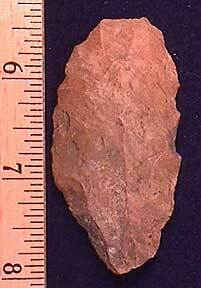 (P75) Flake knife, 3 11/16" L x 1 3/16" W, FL, mottled brown and tan (Coastal Plains chert? 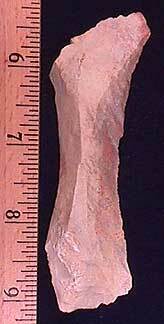 ), thin with fine edge work, base appears to have been intentionally made this way as it fits the left hand perfectly, from my personal collection, $20. PRICE REDUCED TO $15. 03/02/08 P81. 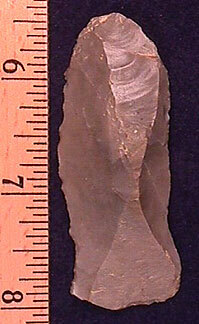 (P76) Backed uniface knife, 3 5/8" L x 1 3/8" W, Bath Co., KY, Carter Cave chert, very fine edgework along cutting edge, other edge dulled, this has been in my collection for many years, $45. PRICE REDUCED TO $39. 03/02/08 P81a. (P76a.) 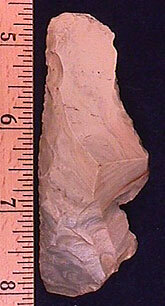 Shot of edgework. 03/02/08 P82. 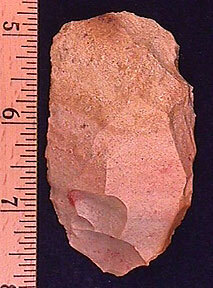 (P77) Uniface knife\scraper, 3" L x 1 3/4" W, KY, pretty material with subtle colors, fine edgework along working edges, $15. PRICE REDUCED TO $11. 02\04\08 P83. 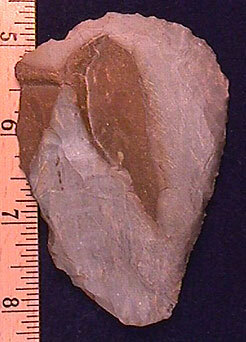 (P78) Uniface tool, 2 9/16" L x 1 5/16" W, found by Don McAlister Suwannee River, FL, river-stained Coastal Plains chert, ex- J. Sherman and A Hyde collections, pretty with nice edge work, $6. PRICE REDUCED TO $4. 11/08/07 P84. 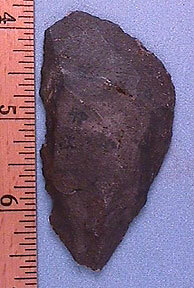 (P79) Big uniface tool\blade, 4 5/16" L x 3 1/8" W, FL, river-stained Coastal Plains chert, spoke-shave on right side, left side shows use as a scraper, from my collection, ex-Allen Hyde, a real hand-full, $29. PRICE REDUCED TO $20. 11/08/07 P85. 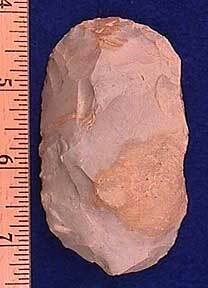 (P80) Uniface scraper, 2 7/8" L x 1 9/16" W, FL, river-stained Coastal Plains chert, from my collection, ex-Allen Hyde, well made example, $13. PRICE REDUCED TO $10. 11/08/07 P86. 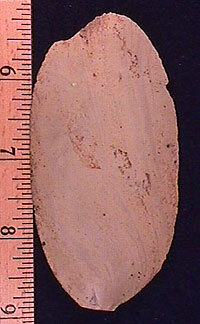 (P81) Uniface scraper, 3" L x 1 11/16" W, FL, brown\orange river-stained Coastal Plains chert, from my collection, ex-Allen Hyde, much nicer than the picture, $10. PRICE REDUCED TO $8. 11/08/07 P86a. (P81a) Top view of the above. 11/08/07 P87. 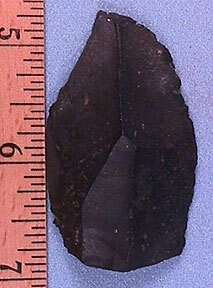 (P82) Uniface blade\scraper, 2 1\4" L x 1 3/8" W, FL, dark blue river-stained Coastal Plains chert, from my collection, ex-Allen Hyde, nice edge work, $5. PRICE REDUCED TO $4. 11/08/07 P88. 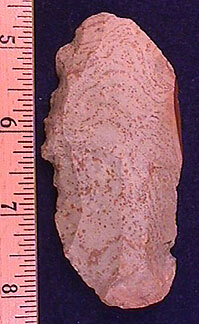 (P83) Uniface scraper, 2 1/2" L x 1 7/16" W, FL, brown\orange river-stained Coastal Plains chert, from my collection, ex-Allen Hyde, very nice edge work, $6. PRICE REDUCED TO $4. 06/04/07 P89. 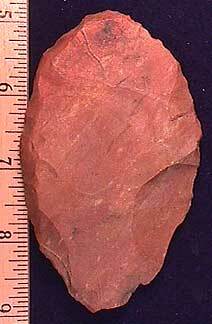 (P84) Flake knife, 3 13/16", GA, tan with light red Coastal Plains chert, unifacial with good size, $15. PRICE REDUCED TO $9. 06/03/07 P90. 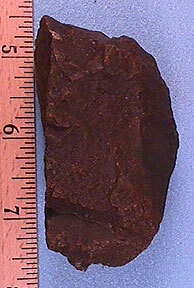 (P85) Uniface scraper, 4 1/16", TN\AL, river-stained Ft. Payne, ex-Gilbert Cooper, nicely worked, $49. PRICE REDUCED TO $39. 06/03/07 P91. 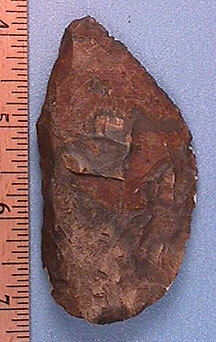 (P88) Uniface scraper, 2 9/16", TN\AL, river-stained Ft. Payne, ex-Gilbert Cooper, nice edge work, $12. PRICE REDUCED TO $9. P92. 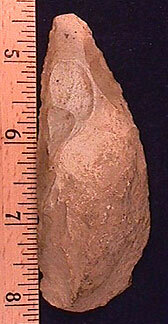 (P89) Side scraper, 2 15/16", FL, river-stained Coastal Plains chert, ex-Allen Hyde, from my personal collection, well made, $15. PRICE REDUCED TO $12. 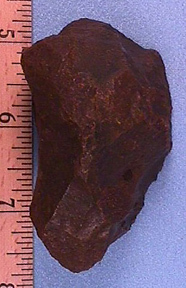 P93. 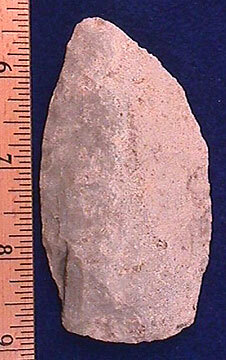 (P90) Late Paleo/Early Archaic knife, 3 1/2 x 1 7/8", MO, fine grained quartzite, nicer than the picture, priced right at $20. PRICE REDUCED TO $14. P94. 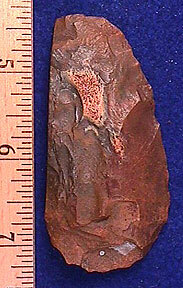 (P91) Scraper, 3 5/16" x 1 3/4", Santa Fe River, FL, river-stained Coastal chert, ex-Jacky Fuller, fine retouch along the working edges, from my personal collection, $25. PRICE REDUCED TO $19. P95. 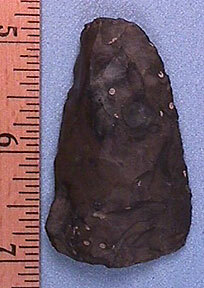 (P92) Scraper, 2 7/16" x 1 5/8", FL, Santa Fe River, FL, Coastal chert, ex-Alton Martin, fine edge work along 3 sides, from my personal collection, $12. PRICE REDUCED TO $9. P96. 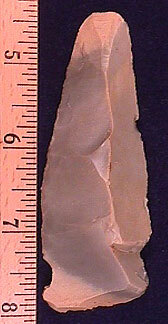 (P93) Double sided scraper, 2 1/4" x 1 3/8", Wakulla River, FL, river-stained Coastal chert, ex-Tom Goodwin, fine edge work, from my collection, $14. PRICE REDUCED TO $10. 10/22/05 P97. 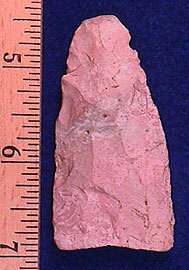 (P94) Paleo knife, 2 7/16", Darke Co., OH, pink and gray, ex-Garry Mumaw, ground base and sides, tip has been reworked in to a scraper, $25. PRICE REDUCED TO $19. 07/24/05 P98. 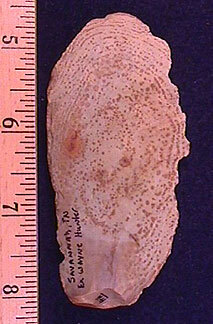 (P97) Unifaced flake knife, 3 1/2", KY, Ft. Payne, made on a curved flake with nice edge work, $25. PRICE REDUCED TO $19. 01/22/05 P99. 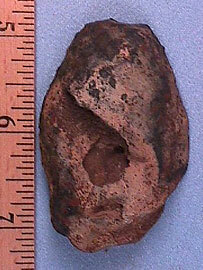 (P98) Dalton, 2 1/2", AR, tan, Tom Davis COA (Grade 5), ground base and ears, very thin, ancient impact fracture on ear $89. PRICE REDUCED TO $80. 01/16/05 P100. 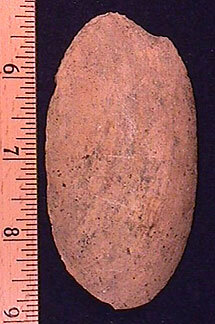 (P99) Unifacial end and side scraper, 3 1/4" L x 1 7/8", TN, Ft. Payne chert, ex-Larry Johnson collection, $20. PRICE REDUCED TO $15.